If you’re like me you take it as read that blogs run by journalists follow the same standards of editorial independence common to good newspapers. However, I did some research into the number of references in body text to three of the leading SL developers, to see if there were any differences between the blogs. I publish the chart below which shows the percentage of mentions that Google found on these sites (excluding duplicate pages) for Electric Sheep, Rivers Run Red and Millions of Us. 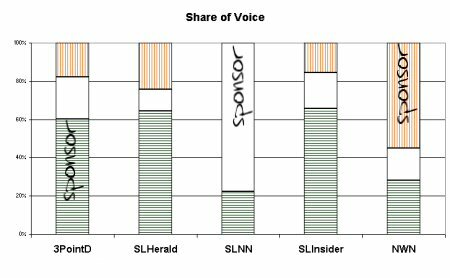 I’ve marked the data points with the word ‘sponsor’ where the blog is sponsored by one of the developers. The searches were done on December 22nd, 2006. I’m not going to comment on the graph other than to say that I do not pretend the results are a detailed or representative survey. It’s just what Google gave me. Sample sizes are small, ranging from 27 mentions for SLNN to 208 for 3PointD. ESC mentions are green, RRR are white and MOU are orange. Im not exactly sure what you mean? Are you saying that these blogs now have biased comments? Well I think the share of voice numbers vary quite a bit and I think more investigation is needed.